While origami began sometime in the 6th century C.E., goalgamiPro has a more recent origin. It was launched 12 months ago and was designed to fill the gap between calculators and widgets on the low end and comprehensive planning software on the high end. goalgamiPro is a quick planning solution and already has around 500 users. It produces modular, single page reports that have questions as the title, such as “What is my plan” and “How do I pay for retirement?” And take just ten minutes to produce. ASI was started in 1995 by Andrew Rudd. According to Ringquist, over 90,000 advisors have used their products, often through private label arrangements. They also have an asset management subsidiary called AdvisorPartners that has around $190mm in AUM and offers SMA products with tax-based indexing, he said. One of the central concepts behind goalgamiPro is that it walks the FA through a simple workflow that builds a household balance sheet for the client or prospect. Ringquist claimed that this features supports further discussions about goals with the client. 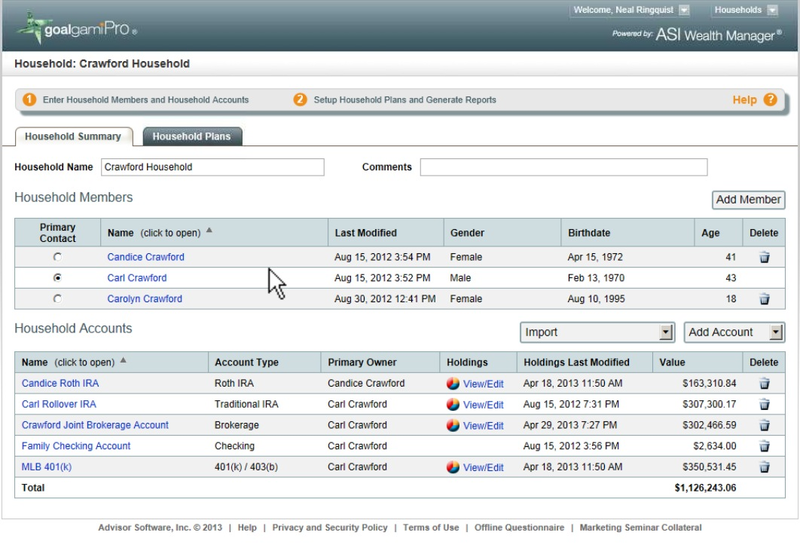 ASI also pitches goalgamiPro as a prospecting tool, since it can be used to run lunchtime seminars to explain the household balance sheet. Using the system, an FA can offer 30 minute assessments for prospects with a set of one-page reports. For example, for a young client with aggressive goals that are funded by future savings, the FA could discuss risk mitigation strategies using the “How Do I Pay for My Goals?” report. She could also demonstrate the wealth effect of the income stream of annuity on the household balance sheet and future goals. Going up against the major players in financial planning market doesn’t phase Ringquist. ASI believes that there is a huge market at the low end with advisors who can’t afford software such as eMoneyAdvisor, Fiserv’s AdvisorVision or other tools that can run $1,000 annually for a single seat license. Also, these applications aren’t practical for smaller clients where a quick, less time consuming solution is better, especially if it can support a discussion around financial goals, Ringquist explained. In this way, goalgamiPro could also be complimentary to a full-featured financial planning system, he said. This makes sense, since there is a subset of advisors that use multiple planning tools to support different client segments. On the high end, some advisors will use Naviplan for their High Net Worth clients since they have significant assets that require complex financial plans. For the rest of their client base, they will use MoneyGuidePro so generate plans that don’t require things like trusts, managed accounts or insurance products. A similar split could be used by smaller RIAs who might have a client base skewed towards the lower end. They would see eMoneyAdvisor or something similar as their full-featured product for higher net worth clients and goalgamiPro would be for generating quick, one page reports for the majority of clients who don’t need detailed financial plans. I’ve included an example of the Household Balance Sheet screen to show that it is well designed and provides access to all the client’s resources (assets) and goals (liabilities). Goals are divided into three categories; Necessary, Target and Aspirational. 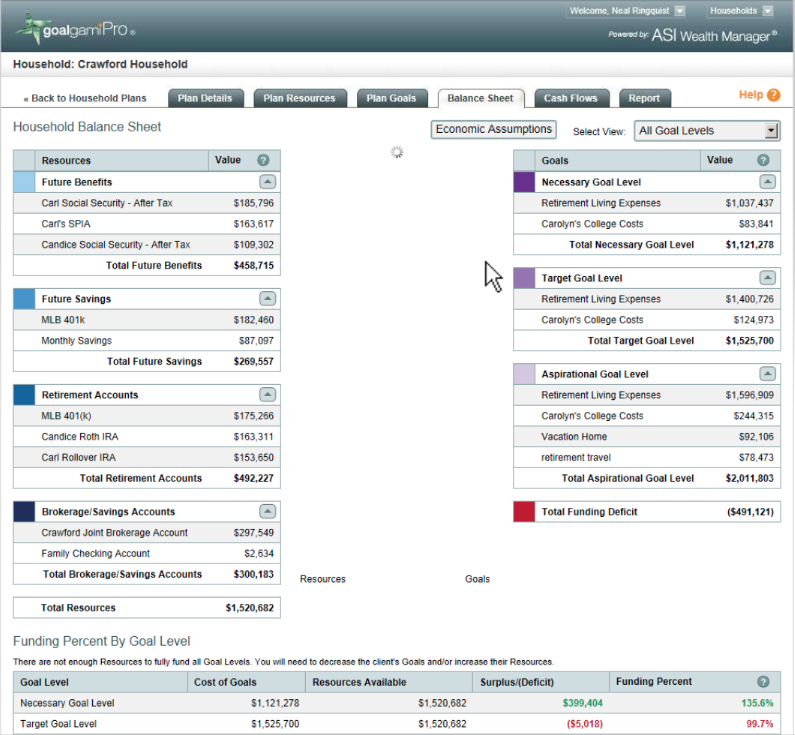 The total funding deficit or surplus is displayed at the bottom of the screen. ASI currently has limited integration between goalgamiPro and applications from other vendors, Ringquist said, but this is changing. While they now provide connectivity only to CRM vendor RedTail and integrate with TD Ameritrade’s VEO platform, they plan on adding Schwab PortfolioCenter and BlueLeaf as well as other CRM’s such as Microsoft Dynamics and Grendel, he reported. goalgamiPro is an entirely web-based application, so no local installation is required. It is also iPad compatible for advisors on the go. The list price is $495 per seat annually with discounts available for bulk license agreements. I believe that goalgamiPro offers a great set of financial planning functionality at a price that is less than half of what full-featured applications such as MoneyGuide Pro or eMoneyAdvisor charge. My guess is that it will be an attractive option for many RIAs looking for a low-cost, easy to use solution that can provide their smaller clients with financial planning services. It’s been fourteen centuries since Buddhist monks brought paper to Japan, enabling origami artists to create millions of folded paper swans and boats. Ringquist and ASI are planning for goalgamiPro to enable advisors to create millions of financial plans, but hopefully in a much shorter time frame. For additional information, you can go to ASI’s Goalgami Pro product page. You may also be interested in watching a video interview that Bill Winterberg did with Neal at the TD Ameritrade Institutional 2013 National Conference. Answering client questions in the an immediate time frame may render more complex solutions obsolete. There is the question of overarching strategy and policy which for the sake of professional standing and the mitigation of fiduciary liability may require a more disciplined approach. 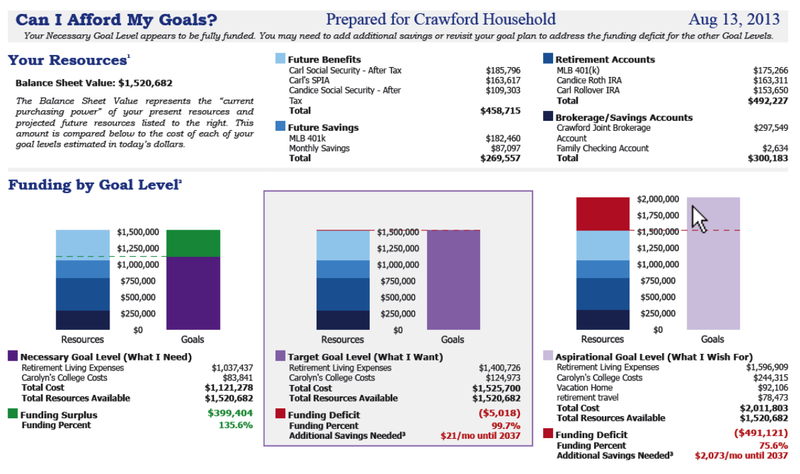 Does this software do retirement income projections? I have a lot interest from clients trying to get the answer to this questions.